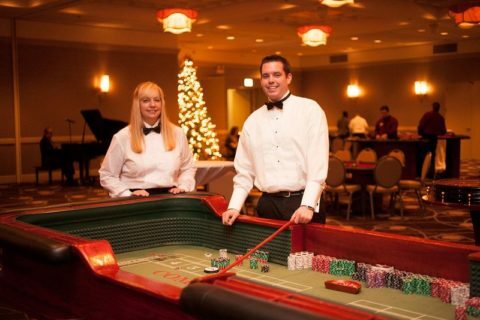 Casino Parties are a great way to create a fun-filled, unique, and memorable experience for you and your guests. Everyone will be able to experience the energy and excitement of a Las Vegas Casino without losing money or anything else of value at a casino theme party. 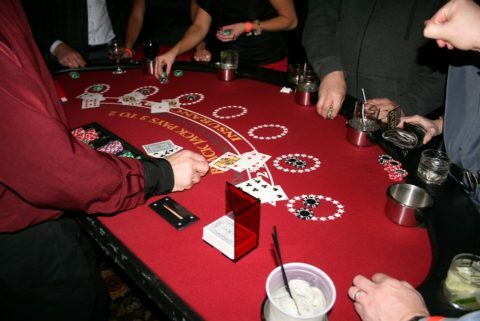 We provide professional casino tables, professional dealers, an on-site Casino Manager, and all the fun you’ll need to throw a party your friends will be talking about for a long time. A Casino Party can be used as entertainment for a private event held by an individual, group, company, or as a fund-raising activity for your organization. The biggest difference between a fundraiser and a private casino party is that those who attend a fund-raising casino party are generally asked to make a monetary contribution in exchange for admission to the event. At a private casino party, those who attend are simply guests of the casino party host. At either event, your guests will be able to participate in various games that can be found in actual Las Vegas casinos. Each guest is usually given a pre-determined amount of chips or funny money. The chips or funny money can then be exchanged for game chips at a casino table of their choosing. The object is always the same, have lots of fun and WIN as much as they can by the end of the casino party. When the party is over, your guests will exchange their winning game chips for raffle tickets or more funny money that they can use to win incredible prizes should the casino host decide to make them available. Although it’s not necessary to have prizes in order for your guests to enjoy their Casino party experience, prizes do enhances the excitement and give your participants something to shoot for. Either way, your Casino Party will be an event to remember. For more information and questions, please Click Here to be directed to our FAQ’s page. Please call us at 317-857-0168 if you would like to talk to one of our professional Casino Party Planners about your upcoming event.